The story is one of a family torn apart. The concept behind it is the effect of nature versus nurture on children, and begins with a rather graphic scene of appalling domestic violence - it’s not giving anything away to say that the first word is “Blood”. This leads us into the immediate aftermath of the attack, and explains how the brothers decide to look after themselves. Their father has been taken to prison, their mother is in hospital, and although there are concerns for the trio, a neighbour agrees to help, and it’s felt that the boys are safe enough in their own home. What the social workers don’t realise is that the older boy, Leo Duvnjac, has realised that the three need money. And he has already thought through a means of making money. It involves a robbery. With Leo’s planning and direction, the brothers are launched on a career as bank robbers, and as they grow to manhood, the three become Sweden’s most wanted men. Their career could not continue. They were caught, and jailed, with Leo being imprisoned for six years. While inside, he met Sam Larsen, and this was the beginning of the book’s story. Because Sam had murdered his father; his brother had reported his crime to the police, and later it was his brother who arrested Leo. Now both are out of prison, and both want revenge. This is a powerful story, with a strong cast of characters, and a rather grim, bleak storyline. Okay, what did I like about it? This is a powerful story, with a strong cast of characters, and a rather grim, bleak storyline., with a series of events and plotlines that keep the reader bowling along. It was a book that had an interesting culture that was entirely new to me. However, there was one aspect that made it less gripping than I had expected, and that was the depiction of women in the story. I was thinking about this for some time after reading the book, and before I put my fingers to the keyboard. This is because any book works or fails for a reader on the basis of an entirely subjective opinion. I candidly confess that I do not like James Patterson’s books. I can say that happy in the knowledge that my own opinion will not hurt his income by even a dollar. There are books I have read which I have not enjoyed, but which many others have. Occasionally I have picked up books and not got on with them at all; on other occasions I’ve picked up the same books and loved them. People’s reading enjoyment can be affected by disputes at home, by work pressure, by losing a favourite pet, so don’t take my opinion. Try the book yourself. In any case: there are two main women in the story. One is the key victim early on - the mother of the three boys. But I never really felt that I was truly involved in her life. Her part in the story was, to me, merely a filler to give the brothers the motivation to turn to crime. Although she does appear later in the book, she never felt fully rounded to me. The second woman is a police officer, a senior detective, who appears almost with fanfare, but who then almost disappears. Her role in the story seems at best rather tangential. I don’t know whether these are true weaknesses of the plot and story, or whether they were in my mind because at the time of reading, I was editing two other works as well as writing a third. Perhaps there was some undercurrent within my own works, or doubts about how I had represented some of my own characters. I cannot say. Read the book and see for yourself. There is one aspect of the book which I would like to comment on, though, and that is the quality of the translation. The woman who performed the translation, Hildred Crill, has succeeded magnificently in creating a book that reads as though it was originally written in English. Translators rarely get recognition for their efforts, but we should all recognise those who succeed so well because they give a book a chance in a new language, whereas a poor translation will destroy a book. This is a book by two authors I had not heard of: Anton Svensson is a writing partnership between Stefan Thunberg, a celebrated screenwriter, and Anders Roslund, an investigative journalist. 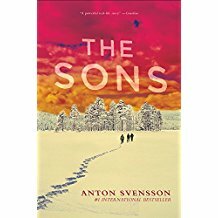 Their first book, Father, achieved rave reviews, and I was keen to see why, so I was glad to receive a copy of The Sons to read. I should just point out that the cover blurb says that this is “The second part of the highly acclaimed” series “Made in Sweden”. I don’t know if this means that the book is intended to follow on from the first, but since it reads well as a standalone, I don’t think it matters. So, yes, it is a very good read, with a compelling story and some believable characters. I would recommend it to those who enjoy psychological thrillers and those who like Scandi Noir.